You’re the final frontier in the Star Trek Distressed Logo T-shirt. The soft blue shirt features a space worn print of the Starfleet insignia with the StarTrek logo. 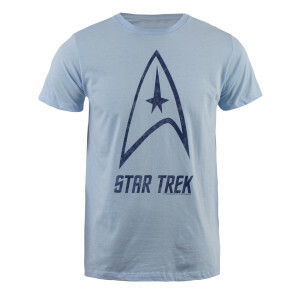 Show you’re more than just a fan when you wear this Star Trek shirt. I gave this T-Shirt as a Christmas present to my boyfriend and he absolutely loved it! I can't wait to get him another T-Shirt from this site. It's great quality and super soft to the touch.